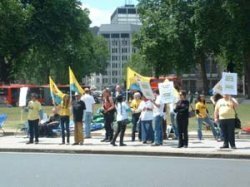 The Metropolitan Police approved the demonstration in Parliament Square, which was called 'to support the PKK's [Kurdistan Workers' Party] objectives of human and cultural rights for Kurds in Turkey' and highlight inconsistencies in UK anti-terror legislation, including the offence of 'glorifying terrorism', which has been in effect since April this year. 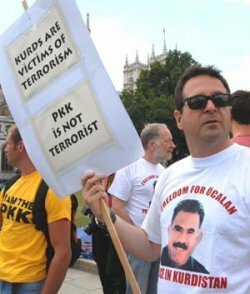 Wearing T-shirts pronouncing 'I am the PKK', many of those present at the demonstration waved flags showing the organisation's jailed leader Abdullah Öcalan - acts which might be construed as illegal under anti-terrorism legislation for the reason that the PKK is a proscribed organisation in the UK. Expressing the contradiction in the police's approval of a demonstration in support of a banned organisation, Mark Thomas voiced his concern that the validity of the legislation was dubious and its definition hazy. Read messages of solidarity from supporters of the protest who were unable to attend in person.